When you see the word “remake”, what’s the first thing that comes to your mind? Is it something like this? Extreme makeover Korean version? J If you had the opportunity to remake yourself, what would you like to change about yourself? Is it your face, your hair, your body or something else? The first things that usually come to mind when we think of “remake” is to change something physical – to lose some weight/fat, to have a more defined body, to change your hairstyle or spectacles to something more cool, etc. But I know we are not so superficial. Of course there’s nothing wrong with taking care of ourselves physically, and we should, but I’m sure there are other things on your mind too when we talk about remaking or change. 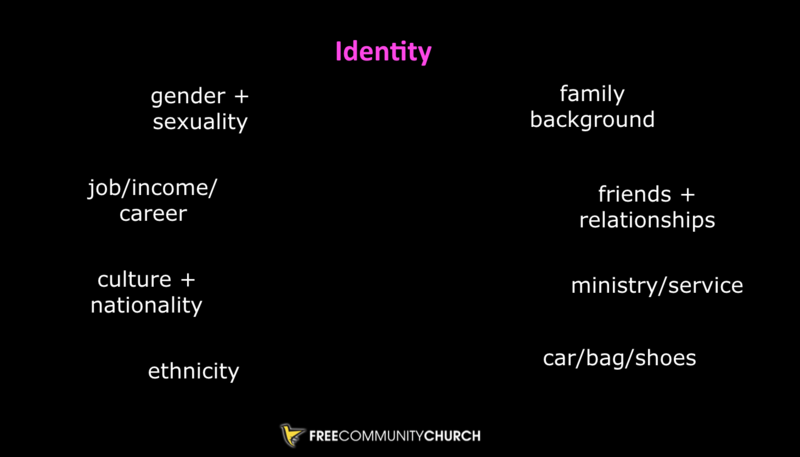 As you ponder over those questions, let’s talk a bit about our identity. 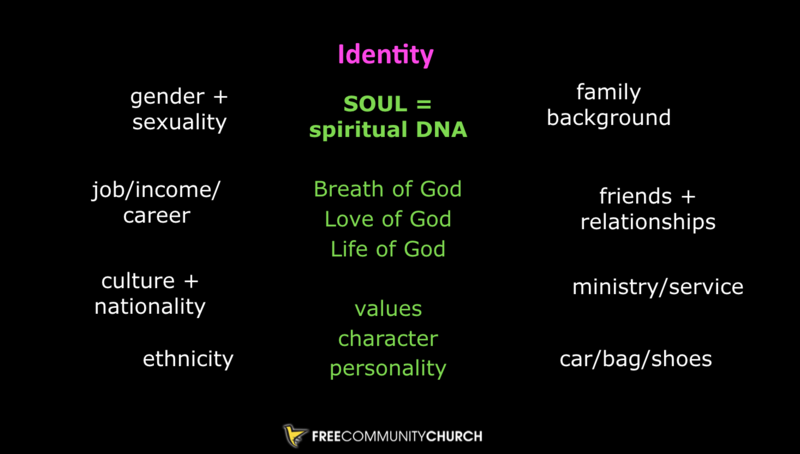 What makes up our identity? What makes you you? These are some things that make up who we are. Where do you sink the roots of your identity into? 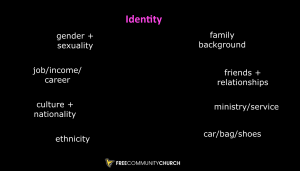 Do you sink the roots of your identity into your gender, your ethnicity, your culture, your family background, your relationships, your job, your car/bag/shoes, your friends, your ministry? Much as these are important parts that make up who we are, these are all our outer or public persona. What makes you truly and uniquely you is your inner person. Perhaps when we think about remake, the inner person is what we need to focus on. Especially in our world where we are constantly scrolling through social media feeds and spending lots of time thinking about how to showcase ourselves or manage the outer projection of our lives, what we may need most right now is to spend some time remaking our inner person. Or allowing God to remake our inner person. What or who can bear the weight of our being fully? Obviously God was extremely pleased when God made us. All of us human beings, whether male or female, transgender, cisgender or gender neutral, God created each one of us to be like God, to reflect God’s nature. Right at the beginning when we were created, God was pleased that each of us reflect God’s nature. We often read the verse “He created them male and female” and automatically assume it refers to the gender binaries of male or female. But notice the verse says “male and female”, not male orfemale. What if all of us have maleness and femaleness inside of us? What if instead of the separation of binary genders, God had meant for us to appreciate the maleness and femaleness in each of us, regardless of what you look like on the outside? Some of you may think I am taking liberties with the Bible or perhaps you think I am making stuff up about the human brain and body. Some may say, “Of course, male and female brains are different and separate! And I’m sure God made men and women very different!” Some people think the difference between male and female brains look like this. But I know we are smarter than that. The fact that many of us are LGBTQ makes us more aware that there is indeed maleness and femaleness inside each of us. And it’s okay! God made us male and female. Why am I sharing this with you? Well, were there times when people put you down, teased or bullied you for not conforming to gender stereotypes? And maybe they even used the Bible to convince you that God meant maleness or femaleness to be a certain specific way and there is something wrong with you? Or maybe there was a time you yourself felt there was something wrong with you and God couldn’t possibly accept you? I want to challenge your mindset of God today…and your mindset of yourself. God made us male and female. So don’t be afraid to let all your maleness and femaleness show. J Maybe this was God’s plan all along? To begin the story with two who are called to “be fruitful and multiply and fill the earth” with different kinds of people who are all called to love one another and worship God in their similarities and differences? I don’t see Jesus calling us to become more manly or womanly. Jesus calls all of us to be made new, to put on Christ, to grow in love, wholeness, and the fruit of the Spirit. These virtues are for all people—male, female, cisgender, transgender and intersex alike. They challenge masculine stereotypes. They challenge feminine stereotypes. Jesus calls all of us to die to our own preferences so that God’s life can grow within us. I just wanted to note that over the years, we have celebrated International Womens’ Day on the first Sunday of March at FCC. This year, we decided to do it differently because when FCC first started the practice of having special services, we held them because it is to highlight minority groups. That’s why we have TDOR and WAD services too. Over the past few years, the number of women at FCC have grown and our focus for IWD in previous years has always been to find ways to bridge between the genders. So while it’s important to celebrate women, I think it’s appropriate for us to celebrate every one of us, regardless of gender, because God made us all to be like God and to reflect God’s nature. What we need to celebrate is the identity that God has given us. So what is this identity that God has made in us? What does it mean that we are godlike? That we reflect God’s nature? Let’s look a little further into Genesis and see what that means. 5-7 At the time God made Earth and Heaven, before any grasses or shrubs had sprouted from the ground—God hadn’t yet sent rain on Earth, nor was there anyone around to work the ground (the whole Earth was watered by underground springs)—God formed Man out of dirt from the ground and blew into his nostrils the breath of life. The Man came alive—a living soul! How do your different translations translate the Hebrew word “ha-adam” (“the man”, the human, etc.) It literally means the “dust creature” or the “earth creature”. And the dust creature came alive when God breathed the breath of life into the nostrils. The meaning of the word “life” here means more than physical life as you well know. The Message translates it well: a living soul. When God breathed life into us, our souls came alive. We carry within us the breath of God, the love of God, the life of God. How precious is that! And how often do we forget? We carry on our lives as if we don’t carry within us the breath of God. We limit ourselves by sinking the roots of our identity into things that are not sufficient to bear the weight of our being. There are many things we may have sunk our identity into — our relationships, our intellect, our careers, our ministries, and I spoke a little about our gender earlier. All these make up who we are but they are insufficient to bear the weight of our being. 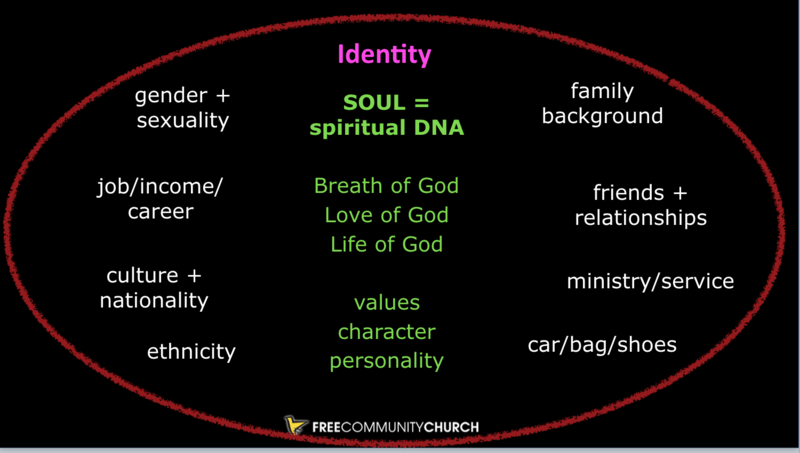 Our soul constitutes our spiritual DNA. It is eternal, divinely unique and core to who we are and all that we are meant to be. When we talk about remaking, we are talking about our souls, our hearts, our spiritual DNA. You see, the problem is God breathes life into us in the beginning. But along the way, our hearts turn stony or cold. There are many reasons and circumstances that cause our hearts to turn cold. But it’s not an unusual thing. It’s happened throughout human history. Throughout the Bible, we see how God constantly engages with people who turn away and how God pulls them back time and again. We see this described by the prophet Ezekiel. Just as God breathed life into us in the beginning, God wants to gives us a new heart and spirit. This is God inviting us to a Remake. But are you willing? 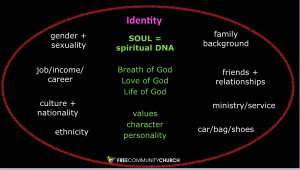 As you look at this diagram, what are some of the thoughts and beliefs about your identity that hinder or limit you in living out your life fully as a soul who carries within you the breath of God, the love of God, the life of God? 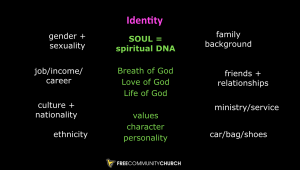 Just over this past week as I was preparing this sermon, I saw an article that both Kyn and Cynthia posted and it spoke so eloquently about what it means to truly live out our full identities as God had created us to. The article quoted from a book by Parker Palmer and I want to share some of the insights with you. “Integrity that comes from being what you are” means being able to hear our souls speak. It means being able to hear what God is speaking to us there.It means finding alignment between our soul and our outer lives. That is Wholeness. Two Sundays ago, I spoke about the tensions of this verse: “But you are called to something higher. Be perfect, as your Father in heaven is perfect.” (Matt 5:48) And I told you that the original Greek word istelios, which actually means “completeness in growth and character, to be mature or fully grown, complete in all its parts. In other words, to become WHOLE. Over this past week, I’ve been talking to some of our church members who are going through a rough time. It was tough for me sitting with a lot of brokenness and broken relationships, and how much tougher it must be for them! I am usually quite good at making sure I take care of myself emotionally even as I counsel and minister to those who are hurting or in anguish. But I must admit their pain has an impact on me, and it was harder this week because there were quite a few of them. And I can understand how difficult it must be for them to think of using devastation as a seedbed for new life. But it’s true. Wholeness means embracing our brokenness as an integral part of life. That’s why Miak and I are planning a SuperSunday series called Kintsugi: Embracing Our Brokenness. Some people have asked me if this is like Wholeheartedly and I just wanted to say the content is not the same and it’s more like a follow through from Wholeheartedly. In our pastoral work, Miak and I have seen a lot of broken relationships and one day, we were discussing about the link between the development of our identity and how that impacts our relationships. So if you’ve been wondering why you have been experiencing broken relationships or why LGBTQ people seem to have more broken relationships, then come join us. So how can we live whole lives? How is God wanting to remake you and me at the soul level? Firstly, there is remaking on the individual level where we allow God to first give us a new heart and spirit. Then we learn to listen to that inner voice within us as the Holy Spirit moves. This can help us bring alignment between our inner and outer lives. Secondly, we cannot do this without community.Palmer draws from the old Quaker practice of the “circle of trust” to describe in detail a reliable means for creating space and offering community for our soul to speak. He says, “No fixing, no saving, no advising, no setting each other straight,” which is the main rule of the “circles of trust”. Instead we learn to speak our truth and engage in “deep speaks to deep” type of listening. The participants create a safe and bonded interaction where each person may listen for their own inner voice. That means in building this circle of trust, we need community. It’s not just the pastors. We need each other and you need to think about how you can be a part of this circle of trust for others. We need to do this together in community. But not just any community. We need a group of people who are committed enough to each other to listen deeply without rushing to fix or to solve. I want to end by asking you the same question I did when we started. If you had the opportunity to remake yourself, what would you want to change today? Do you desire a new heart, a new spirit? Are you tired of living a divided life? Are you willing to create space for your soul to show up? Are you ready to listen to that inner voice? Are you willing to commit to each other to listen deeply without rushing to fix or solve? Are you willing to be a part of this circle of trust for yourself and others? I pray we allow God to remake us and bring us closer to our true identity – dust creatures who carry within us the breath of God. I pray we will devote time and energy to finding alignment between our soul, our inner life and our outer lives. That is true wholeness. That is what we are called to be.